Fundy National Park is located on the Southeastern coast of New Brunswick and is located on the Bay of Fundy, for which it is named. 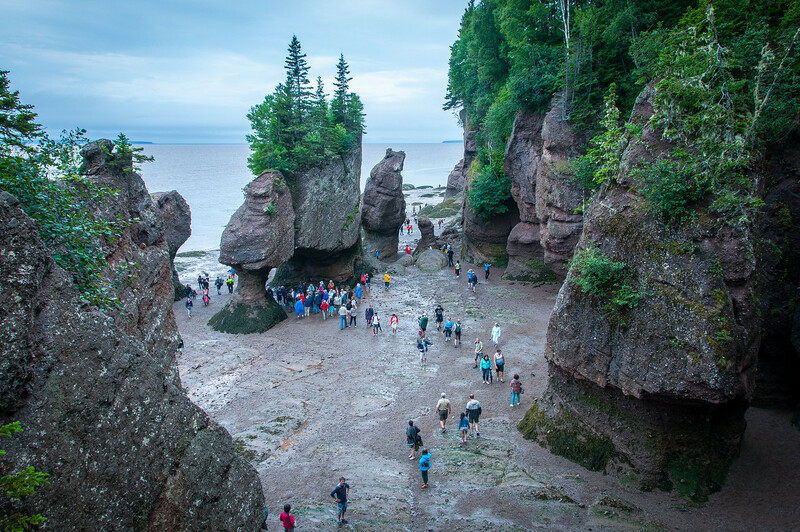 The Bay of Fundy is home to the highest tides in the world, and in the park, you can actually walk on the ocean floor during low tide. In addition to the sights along the coast, Fundy also has many amazing attractions in its interior as well. The photo above is of Dickson Falls, which is one of several waterfalls in the park. Inside the park, you will also find miles of hiking trails, a golf course, and a saltwater swimming pool. There is also a very photogenic covered bridge at Point Wolfe. The environment is similar to what you might find in Northern Maine or in Acadia National Park in the United States. Heavily forested with a rugged coast. 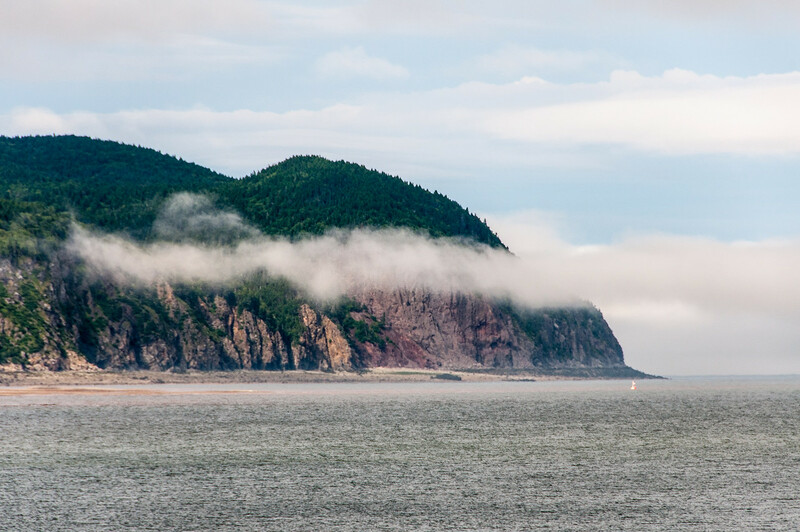 The landscape and environment are very different from Kouchibouguac National Park, which is 2 hours away in New Brunswick but is not on the Bay of Fundy. According to the data, Fundy gets more visitors than Kouchibouguac, but it doesn’t feel that way because the park is larger and it doesn’t have beaches. The park is easily accessible by car from all the major cities in New Brunswick: Fredericton, St. John, and Moncton. Route 114 goes through the park and that is the highway you need to get on to visit. 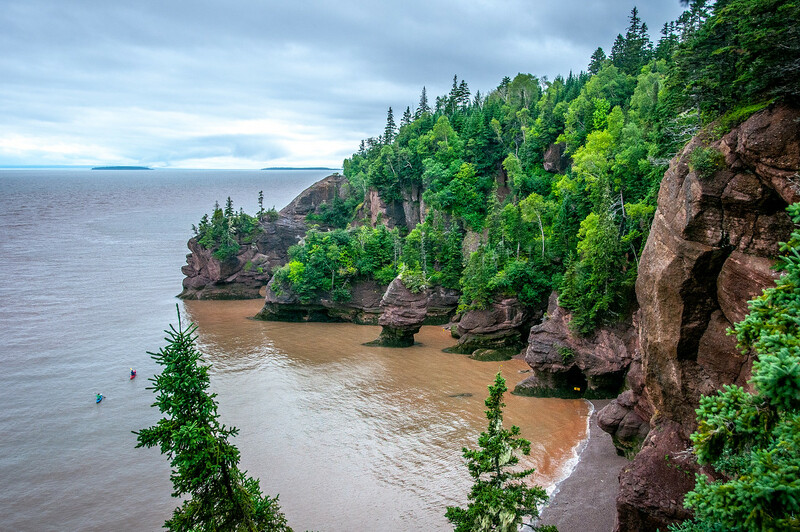 If you are driving from Moncton, you will probably also want to stop at Hopewell Rocks, which is a provincial park about halfway between Fundy and Moncton. Hopewell actually gets far more tourists than Fundy, because it is at Hopewell where you can best see the dramatic change in the tides. In most places on the Bay of Fundy, the tide goes out a very long distance, but you can’t get a real sense of the height of the tides. At Hopewell, there are free-standing rocks which give you a better sense of scale. Camping is available in the park, including oTENTiks available for rent. These are permanent tents with wood floors which can be found in many Parks Canada locations. The nearest town is Alma, which is literally outside the northern border of the park on route 114. There are a few hotels in town which cater to park visitors. It is open all-year round. However, visitor services are only available from January to October. As of 2018, youth admission to the park is free. The other fees are still the same. The park was established in 1948 and is currently managed by Parks Canada. 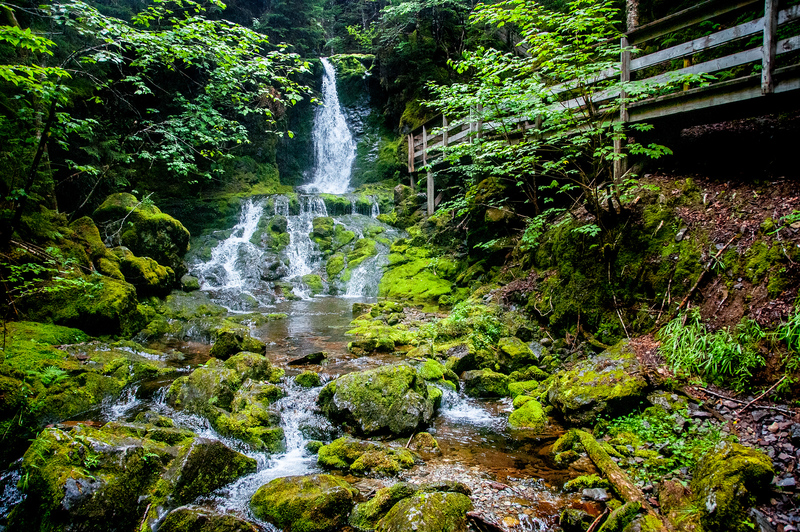 Fundy National Park is visited by approximately 281,289 tourists (as of 2016). Bear and moose crossing are very common occurrences within the park. Hence, tourists are advised about the especially at dusk or dawn. For your safety, always stay along marked trails when hiking. Unmarked trails are not maintain and could therefore pose natural hazards. All surface water are assumed unfit to drink. Hence, visitors are advised to refrain from doing so. The most interesting feature about this park is the highest ebb and flow of water tides. The water level in the park could rise up to 12 meters twice in a day. Fundy National Park is located in Alma, New Brunswick in Canada. It is located along provincial Highway 14. To get here, you can drive via the Trans-Canada Highway 2 (for those coming from Fredericton), or via Highway 1 if you are coming from Saint John. If you want to take the public transportation, there are no buses that offer routes directly to the park. You must travel to the nearest bus stations in Moncton and Sussex. This is a great marvel of nature.